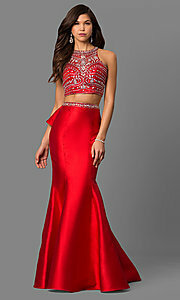 Looking for a long prom dress that is truly spectacular? This two-piece dress, loaded with glamorous details, will wow the crowd at your formal event. The fitted crop top sparkles with a beautiful design of rhinestones and sequins. 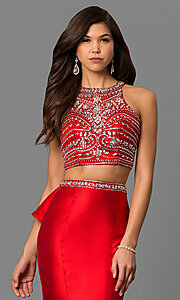 A dazzling jeweled high neckline attaches in back to beautifully frame the cut-out detail on this fabulous prom dress. Matching jewels trim the natural waistline of the gleaming satin skirt that smoothly skims the hips before flowing to the floor in a dramatic mermaid style. The playful back ruffle adds a feminine touch as it flares out from the waist and cascades down to the floor-length hemline of this lovely formal dress. Under $250 for prom or the pageant stage, this elegant two-piece long prom dress will brighten any room on your big night. Top 16", Bottom 49", Hollow to Hem 61"